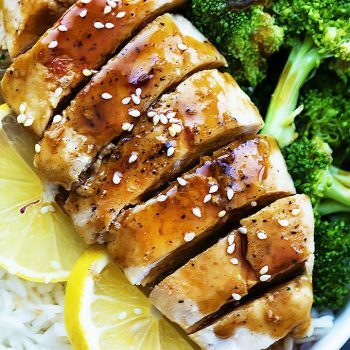 Juicy seared Lemon Teriyaki Chicken slathered in sweet and tangy sauce – perfect with veggies and rice for an easy 30 minute meal! I have two words for you: lemon. teriyaki. I’m a sauce person. I think it’s a family trait because my whole family consists of sauce people. And by sauce people, I mean we want fries with our ketchup you know? Ask any one of my siblings and they’ll tel you the most obnoxious thing about ordering french fries is when you ask for ketchup for your fries and the guy behind the counter hands you three packets. Three? Really?? I need A LOT of ketchup. Three packets is maybe enough for what, seven fries? Well I ordered a large sooooo….. I’m gonna need a little more than three packets people. And if you don’t get with the program here I’m going to have to start taking some drastic measure. Like packing my own bottle of Heinz. But it’s not just ketchup. The issue persists with ranch dressing, hot sauce, bbq sauce and lemon teriyaki sauce. 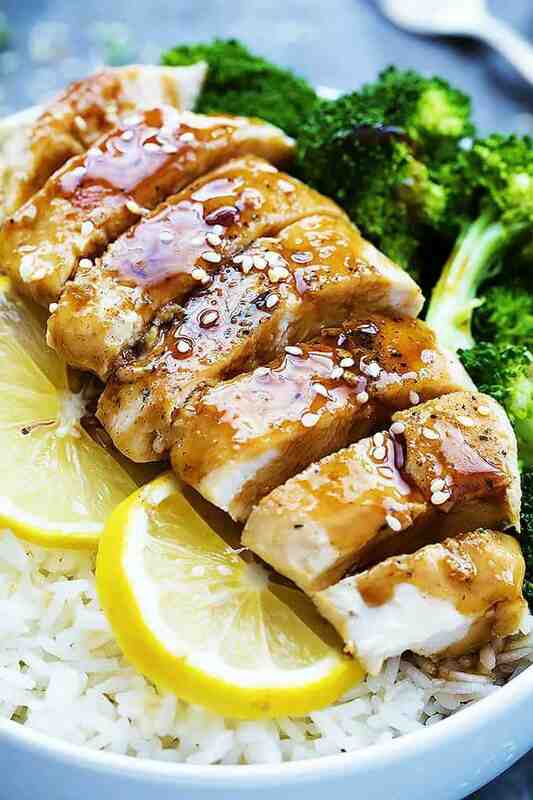 Sweet, savory, tangy lemon and teriyaki sauce poured over chicken and veggies. It’s allll about that sauce. This dish is perfect for busy nights. The whole thing comes together in less than 30 minutes and you can pair that chicken with any of your favorite veggies – I chose broccoli but snow peas, carrots, and zucchini are on my must-have list for next round on this dish. And a double order of the sauce!! 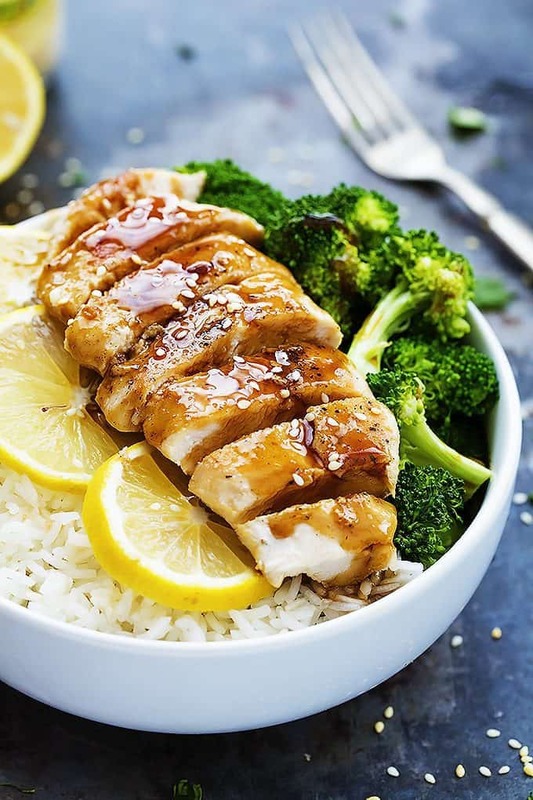 Juicy seared chicken slathered in sweet and tangy lemon teriyaki sauce -perfect with veggies and rice for an easy 30 minute meal! Grease a large pan or skillet. Season chicken breasts with salt and pepper. Place chicken breasts in your skillet and cook over medium heat for 5-8 minutes on each side or until chicken is cooked through. 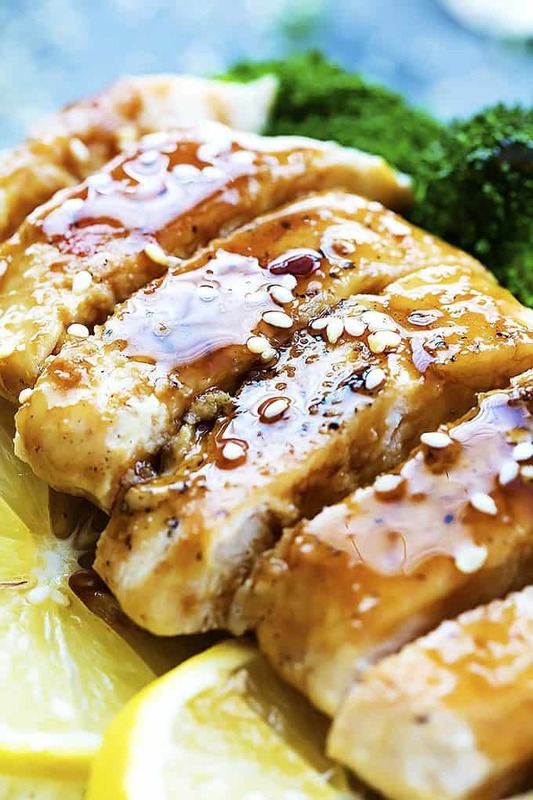 Add sugar, 1/3 cup water, soy sauce, lemon juice, rice vinegar, sesame oil, garlic, and honey to a medium sauce pan. Stir over medium-high heat until mixture comes to a boil. Stir together corn starch and water, add to sauce and stir until thickened. 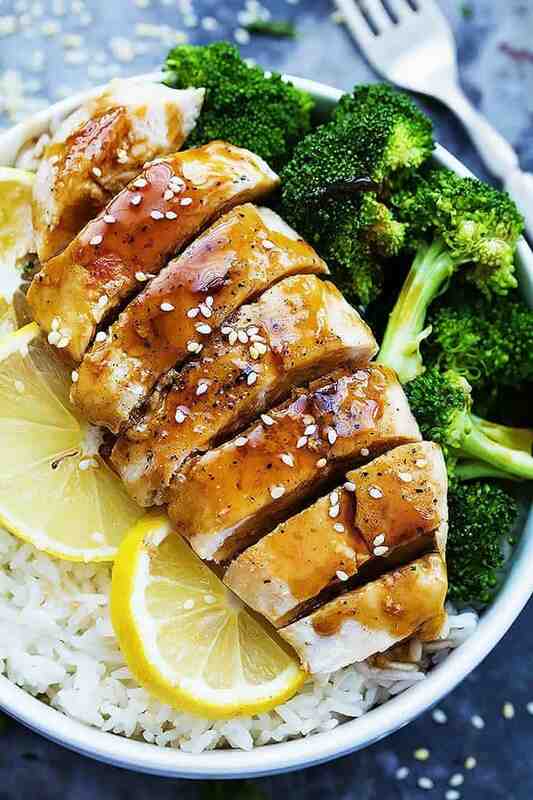 Serve chicken over rice and/or with your favorite veggies and top with lemon teriyaki sauce. Garnish with sesame seeds if desired. Great this will be made tomorrow.have some leftover chicken from today’s roast. Whats worse than being given the 3 packets of ketchup is asking for more and then they only give you 1 more packet! c’mon, a min of 12 packets for sure!!! – Anyhow, chicken looks great, will give it a try this week! I have two words for you. SINFULLY. DELICIOUS. Aw thanks Tania!!! This chicken is worth 30 minutes of your time trust me – you’ll love it!! Looks delicious! I want to try this with noodles! I use in place of the rice vinegar? You could use another vinegar – white or apple! Would this work in the crock pot? Cook the chicken in the sauce? Hi Crystal! I haven’t tried this dish in the crock pot myself but I think that could definitely work! I would probably chop the chicken into bite-size pieces before adding to the crockpot. I think I just found the cooking blog to follow…somehow we have to be related. Your magic word that got my attention is SAUCE!!!! I have embarrassed my family for years because of my addiction to SAUCE! As far as I am concerned, food is only a polite means of getting sauce to your mouth. When alone…just give me a spoon! 🙂 Any recipe that I try that has a sauce, the sauce recipe gets doubled. Ketchup, horseradish and Worcestershire sauce are a constant must have to mix together for meat that doesn’t come with a sauce. Strangely though, there is one item I do not sauce and that’s a good steak. And these professional Italian chefs that say the pasta should not be drowned in sauce would probably kick me out of their restaurant because I would probably keep asking for more sauce for my pasta. Amen!!! I am so there with you – sauce is a MUST!! I’m pretty sure I have an addiction ha. The more the better! And gimme every kind imaginable!